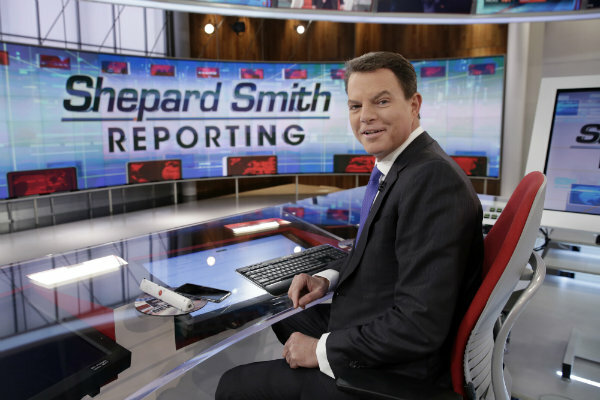 After Shepard Smith set off some internal Fox News Channel bickering over his description of “entertaining” opinion programming, a glance at the cable television rankings reveals the extent to which political talk has become a pastime for millions of Americans. The Nielsen company said 26 of the 40 most-watched programs on cable television last week were political shows on Fox News or MSNBC, including each weeknight telecast by Rachel Maddow, Sean Hannity and Lawrence O’Donnell. movie — made the list. Smith, the afternoon news anchor who signed a contract extension last week, had one show on the list. He said in an interview with Time magazine that some of Fox’s opinion programming “is there strictly to be entertaining. Smith also said that Fox’s opinion shows don’t really have rules. “They can say whatever they want — if it’s their opinion,” he said. That comment drew rebukes from Hannity and fellow Fox primetime host Laura Ingraham, who said both of their shows make news. Maddow’s Tuesday evening telecast on MSNBC, with 3.42 million viewers, was the most-watched news program on cable last week, Nielsen said. Hannity was in second and third place. Sixteen of the 26 political programs were on Fox, with the other 10 on MSNBC. Fox, which averaged 2.31 million viewers in prime time last week, was the most-watched cable network while MSNBC was second with 1.98 million, Nielsen said. CNN, which averaged 1.11 million viewers in primetime last week, has been losing ground to its rivals recently as viewers settle into political camps. That may be behind its decision last week to shuffle its lineup, adding a prime-time show with Chris Cuomo as host. CBS was the most-watched broadcast network last week, averaging 7 million viewers. NBC had 5.6 million, ABC had 4.7 million, Fox had 2.6 million, Univision had 1.6 million, ION Television had 1.5 million, Telemundo had 1.1 million and the CW had 1 million. Following Fox News and MSNBC, the remaining three networks in cable’s top five were boosted by the NCAA men’s basketball tournament. TBS averaged 1.78 million, TNT had 1.77 million and TruTV had 1.55 million. ABC’s “World News Tonight” topped the evening newscasts with an average of 8.8 million. NBC’s “Nightly News” had 7.9 million and the “CBS Evening News” had 6.7 million. Below are primetime viewership numbers compiled by Nielsen for March 12-18. Listings include the week’s ranking and viewership. 1. “NCIS,” CBS, 13.27 million. 2. “The Voice” (Monday), NBC, 11.88 million. 3. “The Voice” (Tuesday), NBC, 11.18 million. 4. “This is Us,” NBC, 10.94 million. 5. “Bull,” CBS, 10.64 million. 6. “60 Minutes,” CBS, 10.08 million. 7. “The Good Doctor,” ABC, 9.89 million. 8. “NCIS: New Orleans,” CBS, 9.25 million. 9. “Instinct,” CBS, 9.05 million. 10. “American Idol” (Monday), ABC, 8.41 million. 11. “Survivor,” CBS, 8.38 million. 12. “NCIS: Los Angeles, 8.02 million. 13. “American Idol” (Sunday), ABC, 7.81 million. 14. “Little Big Shots,” NBC, 7.54 million. 15. “Grey’s Anatomy,” ABC, 7.18 million. 16. “The Big Bang Theory,” CBS, 7.08 million. 17. NCAA Men’s Basketball: Ohio St. vs Gonzaga, CBS, 6.85 million. 18. “The Walking Dead,” AMC, 6.66 million. 19. “911,” Fox, 6.55 million. 20. “Chicago PD,” NBC, 6.54 million.